Being successful is about the investment you are willing to make in yourself. 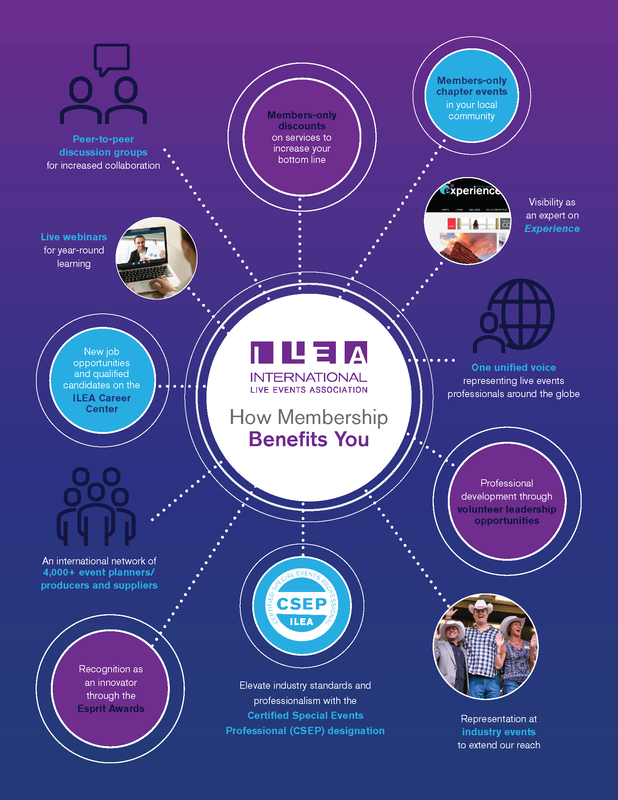 Investing in ILEA through membership and involvement offers you a host of benefits for professional development and recognition through strategic alliances, as well as access to an unparalleled network of event professionals around the world. Through our monthly programs, you will learn about industry topics and trends that will help you gain relevant skills to grow your knowledge base. These programs offer great opportunities to network with local event professionals who can become your event partners on future projects. As a member, you will receive members-only benefits including discounted access to these programs. Educational opportunities are not limited to local monthly meetings. You have the opportunity to attend the ILEA Live Conference, ILEA international education conference held each August at a member-only rate. Here you can experience hands-on training, well-known industry speakers and educators, networking, and more at this annual international conference. Membership also automatically includes a free subscription to Special Events Magazine every month for the entire year. As an ILEA member, you gain recognition as an industry professional. Your name and company will be listed on the ILEA international website so that future clients and ILEA members can find you and the services you provide. You are able to submit your work for award recognition both locally, for the ILEA Minnesota Star Awards, and internationally, for the ILEA Esprit Awards. Gain your Certified Special Events Professional (CSEP)designation, the hallmark of professional achievement in the special events industry, and truly set yourself apart in the field. ILEA has partnered with leading providers to offer discounts on services you need to stay competitive, increase your bottom line, and operate more efficiently: business management services, car rentals, shipping, and technology.